Part 1. What is Synchrotron Radiation and Why is it Important? In the past year a number of reports have been released that confirm the increased demand for synchrotron radiation in order to carry out x-ray crystallography of biological macromolecules. There were other well-documented concerns that current capabilities were not adequate to accommodate this demand. To address these concerns, a Working Group of the Office of Science and Technology Policy was established to study how access to the beamlines for x-ray crystallographic studies could be improved. The need for development of additional capabilities to serve other users of synchrotron radiation will require separate consideration. There have been numerous demonstrations of the advantages of using synchrotron radiation for crystallography: rapid data collection, use of smaller crystals than with conventional x-ray sources, and the ability to conduct measurements at multiple wavelengths. Because of these characteristics, the demand on the available synchrotron facilities has grown rapidly. As measured by depositions in the Protein Data Bank, the percentage of macromolecular crystal structures determined using synchrotron radiation increased from 18 percent in 1990 to 44 percent in 1996. The demand for synchrotron access is likely to increase even more rapidly in tandem with developments in genomics, where the discovery of new proteins will provide new opportunities for understanding protein structure and function. These organizations support the rings and the accelerators. The beamlines, through which the radiation is utilized, receive support from various sources, including beamline operators or consortia of users, such as industry, university groups, and government programs. The federal agencies that provide some of this support include components of NSF, DOE, and NIH. Detectors and other equipment: Efficient utilization of the beamlines requires upgraded equipment, especially detectors, that will both improve throughput and add scientific capabilities. Much of the current need for detectors appear to be met by planned agency expenditures. However, approximately another $2 million to $3 million may be required for detectors and other equipment. Future requirements are estimated to be about $3.75 million in the short term, based on the current number of equivalent beamlines available for general users. Research and development: R&D in both hardware and software will result in both increased efficiency and the ability to do new science. No exact dollar value can be assigned to this effort. Applications for development of detector technology are now being considered, and a transagency announcement to stimulate joint research applications for relevant R&D is encouraged. Improved access procedures: Several reports on synchrotron use have stated that the current mechanisms for application and review of beam time need to be more rapid and streamlined. The Working Group strongly encourages discussions among all the interested parties to address this issue. Upgrades in facility operations: The Working Group strongly recommends the initiation of upgrades for the DOE-supported synchrotrons. Although the operation of CHESS is reasonably secure for the next five years, beyond that time the situation is much less certain. A group should be assembled to assess the consequences for CHESS and the crystallographic community if funding for this facility is lost within the next decade, as well as to consider current operating requirements. Expansion of existing crystallographic capabilities: Discussions of expansion were focussed on ALS and CAMD. ALS currently has an operating crystallographic station, and there is potential to significantly expand the capabilities of ALS to further support crystallography. There is at the present time no such station at CAMD, and its potential is still unknown. However, considering the value to the crystallography community in the South and Southwest of regional access, the opportunity to establish a station at CAMD should be carefully considered. Additionally, new beamlines will be needed at the other synchrotrons as demand increases. Because of the lag time of up to three years in developing a beamline, it is necessary to start considering possible construction well before the time when user demand would saturate the new beamline capacity. The rapidly expanding need for synchrotron facilities to carry out x-ray crystallographic studies of macromolecules has been well documented. Three outstanding analyses provide an almost comprehensive overview of requirements and resources - "Report of the Basic Energy Sciences Advisory Committee Panel on D.O.E. Synchrotron Radiation Sources and Science", November, 1997; "Structural Biology and Synchrotron Radiation: Evaluation of Resources and Needs", from the Structural Biology Synchrotron Users Organization, December, 1997; and "Survey of Structural Biology Beam Lines and Instrumentation at US Synchrotron Centers - Needs and Opportunities for the Future", developed by Keith Hodgson and Eaton Lattman, February, 1998. These publications will be referred to as the BESAC Report, the Biosync Report, and the Hodgson/Lattman Report, respectively. In addition, a Structural Biology Subcommittee of the DOE Office of Biological and Environmental Research (OBER) Advisory Committee, chaired by Dr. Jonathan Greer, has produced a document¾ using the information in the reports noted above¾ that develops "recommendations as to the resources and processes that are necessary for the proper support of the macromolecular crystallographic community at the synchrotrons" (the "Greer Report", p.1). The present communication by the Office of Science and Technology Policy (OSTP) Working Group on Structural Biology at Synchrotrons, (referred to in this document as "the Working Group"), is based on the information provided by all of the reports listed above. The members of the Working Group are listed in Attachment 1. A list of agency personnel who provided significant assistance in the discussions and preparation of the report is provided in Attachment 2. As stated in the Biosync report, " The U.S. national capacity for crystallographic experiments at synchrotron resources has approximately doubled since 1991�. However, demand continues to outpace supply by a factor of approximately two (Biosync, p.14)". The BESAC Report states that "access to a synchrotron beamline for macromolecular crystallography (is) essential to almost any structure problem (BESAC, p.66)", and "it is expected that structural biology use of the synchrotron will continue to increase dramatically for the next decade (BESAC, p.72)." Furthermore, the BESAC report notes that already today "The major impediment to use of the synchrotron has been timely access to beam time (BESAC, p.71)." 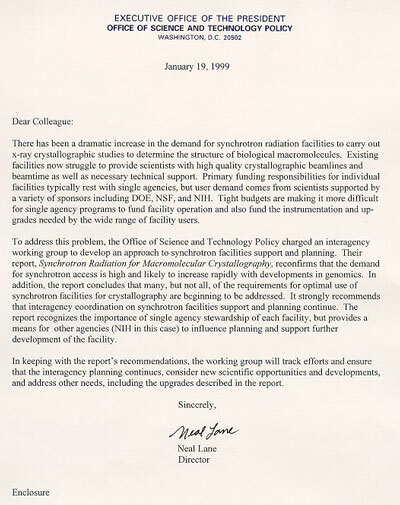 To address these concerns, a Working Group of the Office of Science and Technology Policy was established to examine how current and future access to beamlines for macromolecular x-ray crystallography could be improved. Additionally, longer-term improvements in capabilities were also to be considered. As noted in the Biosync Report, "Collaboration of (the agencies) would increase operational efficiency and planning for synchrotron source upgrades and the infrastructure required (Biosync, p.9)." The Working Group's primary goal is to stimulate such interagency collaboration, which should result in more efficient use of resources and improved synchrotron access for crystallographers. It is important to note that synchrotron radiation is of great importance in many areas of science, including many areas of biology, through the implementation of techniques such as small angle x-ray scattering, x-ray microscopy, and x-ray spectroscopy. This report focuses on crystallography because of the great increases in demand and heavy utilization of the synchrotrons by the crystallographic community. The requirements of other research communities for which synchrotron access is essential should be considered separately. Part 1: What is Synchrotron Radiation and Why is it Important? A synchrotron is a ring-shaped particle accelerator that uses electric fields to accelerate charged particles, and magnetic fields to steer them in a circular path. As the particles, such as electrons or positrons, travel along the circular path near the speed of light, they lose energy by emitting electromagnetic radiation, which is called "synchrotron radiation." For high-energy physicists this is a nuisance. But for users of X-rays these emitted beams are a wonderful bonus. Initially the applications of synchrotron radiation were entirely parasitic on high-energy physics experiments. Increasingly the applications have become an end in themselves and rings have been developed with this use in mind. The rings simply generate the X-rays. In order to utilize them the beam is directed into "beamlines." These have experimental stations that are outfitted with optics, detectors, and whatever else is required for the specific uses that are planned. Support of the beamlines can be provided by the facility operators or by consortia of users, which may include industry, university groups, and government programs. This increased demand has resulted in some serious problems. Not only do many people have difficulty finding time at the synchrotrons, but even for those who are approved the waiting time is typically six months (BESAC Report, p.71). Some concrete examples of increased demand on crystallography stations were provided to our committee for the synchrotron located at Stanford (SSRL) (Keith Hodgson, personal communication). Details for one of the SSRL crystallographic beam lines (a bending magnet MAD station) showed demand at 58 percent of capacity in FY 1996, 95 percent in FY 1997, and 115 percent in FY 1998. A second very high intensity wiggler monochromatic beamline which was in its first full year of scheduling during FY 1998 was very heavily oversubscribed, with a demand that was 323 percent over capacity. The demand for access to synchrotrons is likely to increase even more rapidly given the growing importance of timely and accurate information in drug discovery, the significantly increased capabilities for study of larger and much more complex systems including whole viruses and from developments in genomics where the discovery of new proteins will provide new opportunities for understanding protein structure and function. There are currently five synchrotron facilities supporting x-ray structure studies, and one in which such studies are being considered for development. By far the most significant provider of support is the Department of Energy (DOE), which maintains four facilities. In addition, the National Science Foundation (NSF) supports one facility and the state of Louisiana another one (Table 1). Each of these facilities supports multiple consortia of users at a number of beam lines, for purposes ranging from microscopy to spectroscopy to x-ray diffraction, in fields from biology to geology to materials science. The various synchrotrons have different operating capabilities, of which one important characteristic is the energy at which they operate. This energy, usually indicated in GeV (billion electron volts), determines the energy of the photons that are emitted as synchrotron radiation. Low energy sources, in the range 1.0-2.0 GeV, do not provide X-rays in the region appropriate for diffraction studies at suitable intensities without additional modifications, such as insertion devices (see below). High-energy sources, such as the APS, which operates at 7 GeV, provide both high energy X-rays and high brilliance, e.g. a high intensity of X-rays focused on a small target. The synchrotrons are often characterized as first-, second-, or third-generation sources. A first-generation source is one that is "parasitic", i.e. operated primarily for particle physics. A second-generation source is one that is dedicated to the production of X-rays, rather than to the use of the electrons for particle physics. A third-generation source is one that has been built to optimize high brilliance with an emphasis on "insertion devices." These devices can be inserted into the ring to enhance the operation. There are two categories of insertion devices, called "undulators" and "wigglers." The undulator specifically improves the intensity, focus, and brilliance of the beam. The wiggler improves the intensity to a lesser degree than the undulator, but has a much broader spectral range and does not focus the beam. In addition, the wiggler shifts the wavelength of the emitted X-rays, thus allowing lower energy sources to provide X-rays in the region of interest to crystallographers. Although both of these insertion devices are often used in first- and second-generation rings, they are not as efficient in this environment as in the newer third-generation sources, which are designed specifically to optimize their use. The following provides a summary of the available synchrotron light sources that can be used for biological studies, with an emphasis on their crystallographic capabilities. Because this report only considers light sources that are now capable or can be made capable of supporting crystallography, there is no discussion of the low-energy facilities at Wisconsin and at the National Institute of Standards and Technology. This is a third-generation synchrotron located at the Lawrence Berkeley Laboratory in Berkeley, California, and supported by DOE. Operating at the comparatively low energy of 1.0-1.9 GeV, it is optimized for the ultraviolet and soft x-ray region, and the availability of undulators ensures a very high brightness in these regions. Although the biological applications are primarily in x-ray spectroscopy, the use of wigglers permits development of crystallography beamlines. There are currently seven beamlines at APS devoted to biomolecular crystallography. Of these, four can support MAD measurements, and two can support time-resolved measurements. Five of the beamlines are available to general users, while one¾ operated by a consortium of pharmaceutical companies¾ is now being developed; it will provide 25 percent general user access time. There are a number of other existing and planned beamlines that will provide macromolecular crystallographic capability in the future. Much of this data is summarized in Table 2. It was the opinion of the Working Group that staffing needs probably will be met this year through the additional resources planned by the funding agencies, although it is difficult to be precise about the details. It must be emphasized, however, that the level of four support staff per beamline is a minimal estimate. For example, the NCRR has started a pilot effort at SSRL and CHESS to accept mailed samples for remote access and control of beamlines over the Internet. This will require additional staffing beyond the "normal" levels. Depending on the nature of the research being conducted at the beamline the level of staffing might be higher. Additionally, there may be a significant increase in "naïve" users who require more assistance than the experienced user who has been the norm to date. On the other hand, there is also an economy of scale so that a smaller number of support staff is required for several adjacent beamlines, compared to the same number of individual lines. A reevaluation of the staffing situation should be made after FY99 to determine how well the goal of optimal utilization has been met. The ability of a beamline to rapidly process information depends in part on the availability of a fast detector such as a Charge-Coupled Device (CCD) or other modern devices (Hodgson/Lattman, p.13). In addition, upgrades of other components of the beamlines, such as the optics, are periodically required. A survey of the agencies indicated that they planned to purchase a minimum of six new detectors. Most of these would be installed as upgrades for outmoded devices, but it was agreed that replacement detectors are essential to maintain continued service on a beamline in the case of detector failure. Maintaining a set of spares at every synchrotron seemed excessively expensive, however, and could lead to investment in equipment that is likely to become obsolete after a few years. A set of three to four spare detectors seemed adequate, if they are managed centrally. Needs could then be met by shipping the detectors as required. The primary areas of R&D that are of direct importance for crystallography are detector development, beamline automation, and data collection and other methodology development (Greer, pp.9-10; Hodgson/Lattman, pp.12-13, 15). However, other areas of R&D are important to improve general performance and use, such as efforts to improve beam stability, operation at higher currents, and other aspects of operational efficiency (BESAC, pp. 85-86). As noted in the Greer Report, all of these are "essential to both the immediate and longer term health and growth of the field" (Greer, p.8). Additionally, there are discussions for further increasing x-ray brightness and intensity by development of a fourth-generation source (BESAC, p.91). This is somewhat beyond the scope of the considerations of the Working Group, but may provide new opportunities for many areas of science. Access to beamtime for the general user is most often provided following application of a proposal and subsequent review. However, there are significant differences in the details of the process from one facility to the next. Although allocation is best done at the local level, the complexities of the application process can cause both unnecessary effort and unnecessary delays for the user. The Biosync report noted "the ponderous peer review system" and the need for "alternative mechanisms for quicker and easier access to beamlines" (p.8). Recommendations: The responsibility for allocation of beam time still should reside with the facility managers, who are best positioned to know when opportunities arise that allow access. However, as stated in the Greer report (p.7), "the current system for review of proposals and assignment of beamtime�is poorly matched to today's rapid pace of research;" therefore, there should be "a plan for more rapid and streamlined access for macromolecular crystallography". The development of such a plan is of crucial importance to ensure that actions taken to expand capabilities will not be partially defeated by a review process that is incapable of efficiently dealing with demand. We would strongly encourage joint discussions of facility managers, user committees, and agency representatives to address this critical issue. The effective functioning of individual beamlines is entirely dependent on the quality and efficiency of the storage ring that produces the radiation. It is essential that the facilities operate in an optimal manner to provide optimal user operation. Upgrading the source will generate a beam quality approaching third-generation sources. This is a cheap way of significantly improving the U.S. capacity. Optimizing an existing machine to approach this capability would have major benefits for all users. This would require a commitment of $15 million per year for three years, totaling $45 million. The APS at Argonne is a third-generation source and one of three top-of-the-line synchrotrons in the world, with both high energy and high brilliance. Letting it operate at less than its capabilities is a waste of an exceptionally valuable resource. At the moment, the most urgent need is for additional insertion devices that will increase the hard x-ray capability needed for crystallography and will allow the completion of new beamlines. This will require an investment of about $40 million over five years. CHESS, the NSF-supported machine at Cornell, has been a major resource for the crystallographic community over the years. However, it is parasitic on CESR, the storage ring that supports high-energy physics experiments. The long-term existence of CESR, and consequently of CHESS, depends on its value to the physics community, and this is being questioned. Although no changes are anticipated for at least five years, and significant upgrades are planned for CESR, it is urgently needed that this issue be discussed before the matter becomes critical. In the meantime, it is essential that CHESS be adequately supported. The Greer Report (p.8) suggests that an addition of about $500,000 in operating costs could provide for more effective operation of CHESS in FY99. Recommendations: It is important to emphasize the central roles that the Office of Basic Energy Sciences of DOE and the Division of Material Sciences at NSF play in the operation of the primary synchrotron facilities in the United States. Support of synchrotron operations is not something that can, or should, be accomplished through donations from various agencies or through usage charges. The BESAC report (BESAC, p.119), as well as many other reports, have consistently stated that operational and budgetary responsibilities for a facility should be located in a single agency. It is a consequence of the way science is supported in the United States that national resources such as synchrotrons may be supported through agency components whose programmatic focus is more narrowly disciplinary than the role they actually have in supporting these resources. This is true of both Basic Energy Sciences in DOE and the Material Science Division in NSF that supports CESR and CHESS. It is a serious error to confuse funding of the specific science programs that these organizations support with their responsibility for maintaining the synchrotrons and other large multiuser facilities. It is the belief of this Working Group that all agencies that benefit from these resources should support adequate budgets to allow efficient operation of the resources, and that these budgets be an integral part of the agency appropriation. We strongly recommend a coordinated administration effort to promote this funding. ALS - ALS is a third-generation source that has been optimized for the soft x-ray region. This facility design presents both advantages (brilliance) and disadvantages (low energy) for crystallography. At the moment, there is one x-ray station. However, it is possible to expand significantly the ALS capability to support crystallography by introducing structures called "super bends" into the ring. An application has been received by NCRR to develop this capacity, and peer review should effectively assess its merit. CAMD - this synchrotron, supported by the state of Louisiana and located in Baton Rouge, currently has no operating x-ray crystallography station. Although it is a low-energy source, appropriate insertion devices can improve the capability to conduct crystallographic experiments. It is the only synchrotron located in the South. Recommendation: It is unlikely that any new synchrotron construction will be accomplished in the near future. Consequently, it is essential that existing machines be made as productive as possible. Although CAMD is a small synchrotron that is not ideally configured for crystallography, it provides regional access to a large number of investigators who would otherwise have to travel significant distances to conduct experiments. The value of regional access was noted in the Biosync Report (p.8), the Greer Report (p.7), and in the BESAC Report (pp. 89, 117). For this reason alone, development of a crystallography station would be valuable. Several agencies are considering such a proposal, and we encourage examination of this opportunity. Research and Development: No dollar value can be estimated for the requirements in this area, especially for new detector technology. A number of agencies are now considering applications. The Working Group recommends that a transagency announcement be developed that encourages joint research applications for relevant R&D. Upgrades in Facility Operations: Approximately $121million in major upgrades for the DOE synchrotrons are recommended. These funds should be incorporated into the agency budget. It is essential that all the agencies that benefit from the availability of synchrotron resources support this effort. Expansion of Existing Crystallographic Capabilities: Since it is unlikely that additional synchrotrons will be built in the near future, proposals for expansion at the facilities at ALS and CAMD, which currently have little or no crystallographic capacity, should be carefully evaluated. Additionally, new beam lines at other facilities should be considered on a case-by-case basis. It is difficult to assess how much additional capacity will be needed in the next 5-10 years, but it seems certain that additional capacity will be required. Considering the 3- to 4-year time lag for construction of new beamlines, plans must be developed well in advance of the anticipated requirements. The estimates provided above suggest that relatively little additional funding ($2 million to $4 million) above the amounts already anticipated by the agencies will be required to deal with the most urgent problems of staffing and hardware upgrades in FY99. Also, ongoing efforts should begin to address, if not immediately to solve, issues related to R&D and to new approaches for providing access to the synchrotrons. It is hoped that the sum of these activities will provide some immediate relief to users by increasing available beamtime by as much as twofold. The issues of facility upgrades and expansion of existing beamlines, although not as pressing, are equally important and have not yet been adequately addressed. The Working Group strongly urges action to consider these requirements, which could total between $40 million and $45 million in the first year, to implement an upgrade and expansion plan. Finally, it is essential that the interagency coordination that generated this report be continued. It will be necessary, at a minimum, to track the outcomes of existing efforts to ensure that the projected improvements in staffing and hardware have actually occurred. It is equally important to realize that structural biology is a dynamic area and that circumstances will constantly change. It is necessary to maintain oversight and coordination to ensure that the national investment matches the requirements of the research community. This study by the Working Group on Structural Biology at Synchrotrons focused exclusively on macromolecular crystallography. This was a result of the clear perception that both the scientific yield and the demands by users are increasing more rapidly than the current levels of investment can support. This perception was not the result of anecdotal information, although this was plentiful, but emerged from substantial documentation. This was initially found in the Biosync and BESAC reports, and subsequently in two reports commissioned by the Working Group: the Hodgson/Lattman and the Greer reports. (There is also an as yet unreleased study of crystallographic requirements at synchrotrons in Europe that is entirely consistent with the U.S. evaluations.) It was the availability of this documentation that not only stimulated the Working Group efforts, but permitted the analysis that emerged. The Working Group strongly recommends that other aspects of research at national resources be accorded similar examinations. Interagency groups should consider the current effort directed at crystallography at synchrotrons as a pilot for other considerations of national facilities, such as neutron sources and very-high-field NMR. This attempt to evaluate macromolecular crystallography requirements at synchrotron facilities and to coordinate transagency programs may serve as a model for how to conduct, (or, if unsuccessful, how not to conduct), such a process for other broad application areas of national concern.